Showing My Bias for organic cotton and bamboo yarn with this fresh tank design knit entirely on the 45! Accentuating the bias fabric attributes is simple waist and bust shaping. The tank is divided into two identical parts with a built in I-cord edging. Minimal finishing is key to this quickly knit design. The easy level tech edited and test knit pattern includes written directions, diagrams, and a schematic. Simple Stockinette stitch is used throughout with short rows, shaping, and I-cords. 22 sts and 31 rows over 4”/ 10cm in Stockinette stitch. Gauge is extremely important to this design. 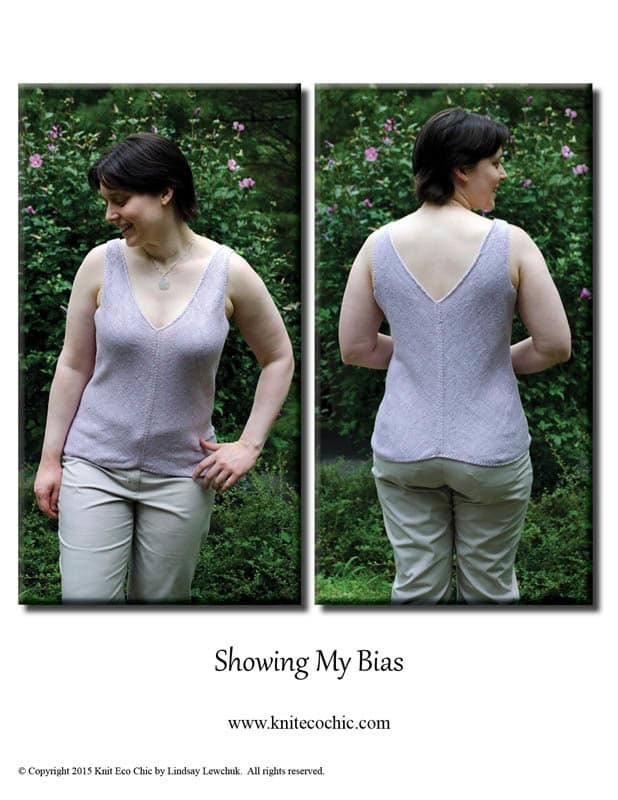 This garment has a slight negative ease due to the unique drape of the fiber and bias design. Be sure to wash and block your swatch to verify the gauge matches. If substituting yarn of the same fiber and/ or drape, make sure your washed and blocked gauge matches the given gauge. If the pre-washed/ pre-blocked gauge is slightly different, that is okay as long as the washed and blocked gauge matches. Cotton and bamboo have a unique drape which changes after washing and wearing. If substituting yarn of a different fiber and/or drape make sure the worn gauge matches. For reference only my working (pre-washed/ pre-blocked) gauge was 28 sts and 36 rows over 4”/ 10cm in Stockinette stitch. The worn gauge is 25 sts and 42 rows over 4”/ 10cm in Stockinette stitch.